Students build three-dimensional models in order to understand the structure of DNA. 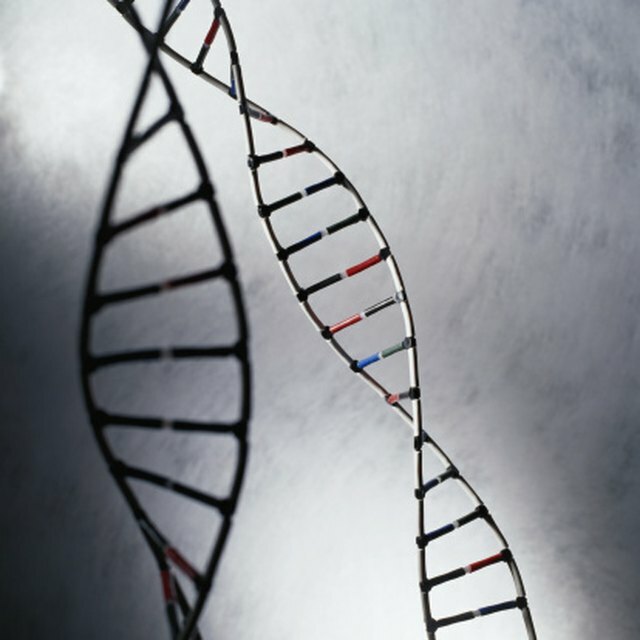 A flattened DNA molecule looks like a ladder. The legs of the ladder consist of an alternating pattern of ribose sugars and phosphates. The rungs of the ladder consist of nucleotide base pairs. A single rung may be either an adenosine-thymine pair or a guanine-cytosine pair. The completed DNA molecule twists in a helical pattern along its entire length. 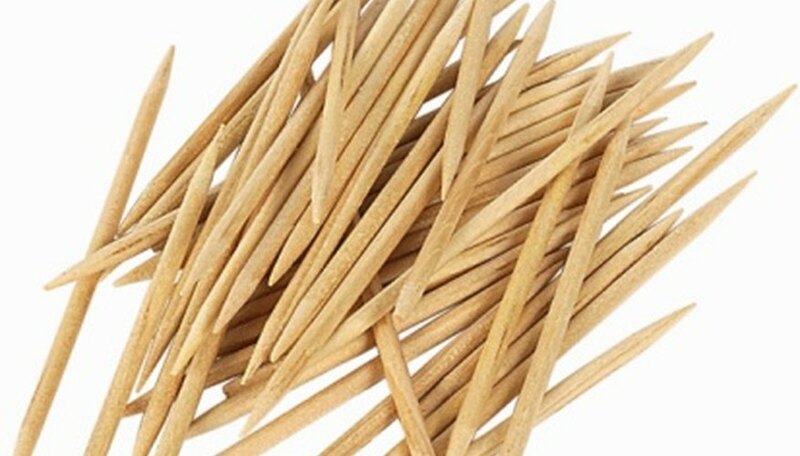 One method of constructing a DNA model is with of toothpicks. Assign a nucleotide to each colored toothpick. For example, red can be adenosine (A), green can be guanine (G), blue can be thymine (T) and yellow can be cytosine (C). Create 20 nucleotide pairs by pressing one toothpick into either side of a mini-marshmallow. The marshmallow represents the hydrogen bonding between the base pair. Pair A with T and G with C. You do not need to create an equal amount of each pairing, but both should be represented. Add a gumdrop to the top of a plain toothpick. The gumdrop represents the ribose sugars, and the plain toothpick represents the phosphate bond between the sugars. Only use one color of gumdrop throughout the building process. Stick another toothpick into the top of the gumdrop. Repeat the last two steps until you have a straight ribose and phosphate chain consisting of 22 toothpicks and 20 gumdrops. When you are finished, you will have a toothpick at each end of the chain. Complete two toothpick and gumdrop chains. Lay both chains parallel on the work surface and measure the length of the chains. Cut the dowel rods to the length of the toothpick and gumdrop chains. Start adding nucleotide pairs at the bottom of the chains, working upward. Press one toothpick into the gumdrop on one chain and then press the matching gumdrop on the other chain onto the other toothpick. Repeat until you add all nucleotide pairs to the chain. Mix up the order of the pairs. Do not always put A on the right and T on the left or G on the right and C on the left. Lay one of the foam blocks at one end of the DNA chain and press the end toothpicks into the foam. Do the same for the opposite end. Hold one block in each hand and gently lift the model into an upright position. Do not let go of the top block because it will not support its own weight. Have a helper hold the top foam block. Rotate the model carefully until there are two turns. DNA has 10 base pairs per turn, so with a 20 base pair model, you should have a single twist in the center of your model. Insert a dowel rod into the bottom block on one side of the model and then press it into the upper block. Repeat with the other dowel rod on the opposite side. Try to press the same amount of toothpicks into each gumdrop or marshmallow to maintain an even distribution. Watson-Price, Erin. "How to Build a DNA Model Out of Toothpicks." Sciencing, https://sciencing.com/build-dna-model-out-toothpicks-8474475.html. 24 April 2017.